A "Triple T" threat is coming to Wall Street, and traders are getting ready. In his latest monthly sentiment survey focusing on FX and Rates, Bank of America's Ralf Preusser looked at the rising global danger from "Tariffs, Transition & Tightening", and asked 66 clients with a combined $345BN in AUM "what impact do you expect from an escalation of US trade tensions", or in other words - how will you trade the coming trade wars? The answer, overwhelmingly, is that most investors anticipate increasing trade tensions, with lower equities as "the preferred play" for 40% of respondents, while another 19% will short the dollar. 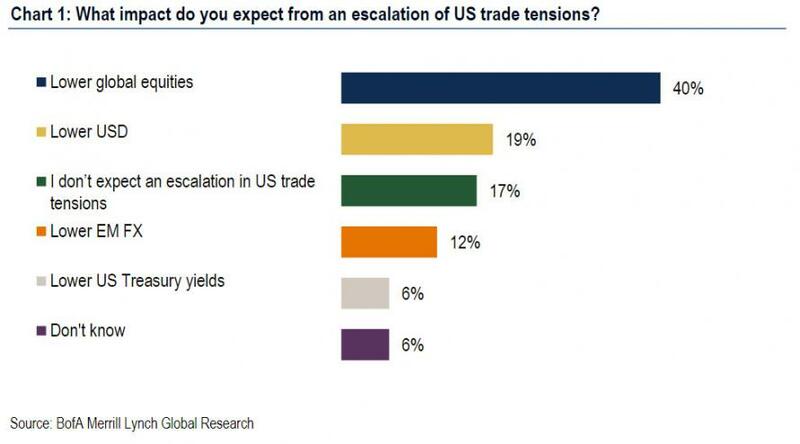 Oddly, 17% believe that Trump's trade war is merely a negotiating gambit and there will be no escalation, while only 6% will go long Treasurys as global trade shrinks (perhaps on the assumption that trade wars are mechanistically inflationary). 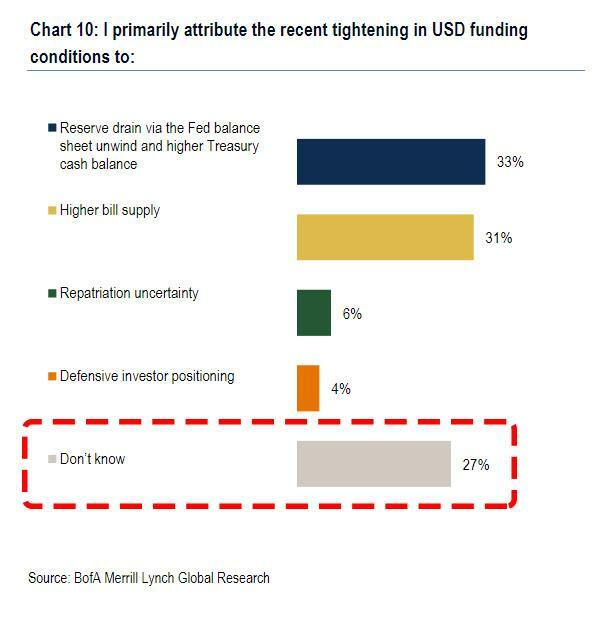 Also notable is that like in other recent and very paradoxical BofA surveys, when asked what is the main driver of the USD, most, or 42%, respond monetary policy divergence - which as Preusser observes is at odds with the short position in USD and bearish sentiment. 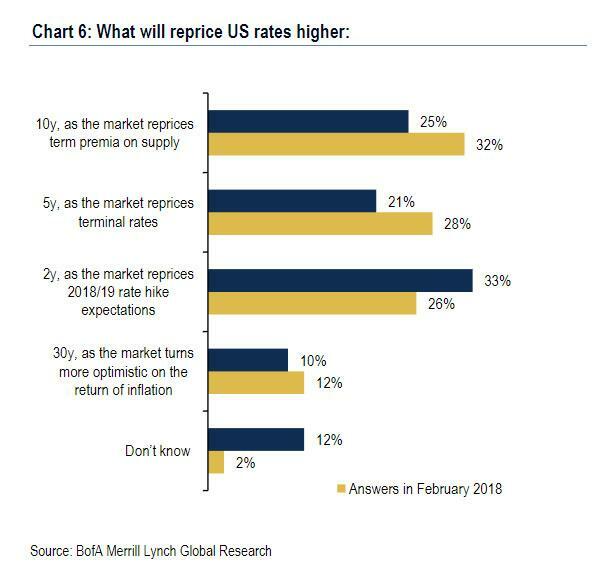 As BofA adds, "uncertainty in the US has risen following the tariff tantrum and the impact of tax reform remains very low on the list of USD drivers according to respondents." Another notable question is "what will reprice US rates higher". Here there was a notable inversion, with a majority, or 33%, saying the repricing will be led by the front-end, or the 2Y, up from 26% last month. Meanwhile, it appears that the coming supply shock has been priced in, with 25% saying the 10Y will reprice the curve, down from 32% in February - which at the time was the most popular response - and another 21% saying curve repricing will be led by the 5% as the market reprices terminal rates, down from 28%. Meanwhile, the most surprising response was that 10% said the 30Y would reprice the yield curve on the return of inflation, suggesting that the market is positioned for more flattening and that any inflation surprise could result in another VaR shock on the long end, or as Bloomberg's Ye Xie says, "What would shock the market is inflation. In other words, Treasury yields need the return of uncertainty on inflation to keep moving higher. Needless to say, the next CPI print will be a key to determine whether inflation is a real threat, as the distortion from the wireless phone plan from last year drops out."